Start small – if you’re a beginner 5m x 10m is recommended. Grow the easy stuff first – the best people to speak to this about are the old timers from your area. Give the soil priority – getting the soil fertile is more than half the work done and will give satisfying results. Having good tools and a shed to keep them in makes things easy. Become aware of the weather and garden instinctively – if you listen and watch carefully it will tell you what needs doing next. Squash, broad beans, leeks, garlic, shallots, kale, purple sprouting broccoli, spinach beet, Swiss chard, corn salad, are some of the easy ones I recommend to start with because they will all grow in shady sites provided the right soil preparation is made and many allotments are shady. The real value of allotments is in salad greens (rocket, kale, mustard, cress, lettuce such as little gem, butterhead, etc..) since they are ridiculously expensive in the shops yet a relatively easy crop to grow, and they simply don’t keep more than a day or two so you have to get them fresh, preferably everyday, and that means having them growing as close to your mouth as possible! I hope that whoever reading this may find something useful in this information and are now inspired to grow some of your own. I strongly recommend buying some local seeds. Check with GIY Ireland - they often organise seed swops. If you have not had an allotment before it can be a bit daunting. 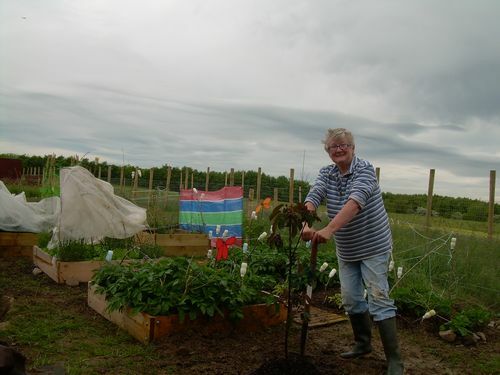 Some allotment managers give out half plots at a time so new allotmenteers are almost on a trial basis to see how they go. I witnessed a guy who did not really know what to do or where to start just scratching the surface of sorting out his plot. Eventually it overwhelmed him. There is a knack to digging, it is called the trench method. I would recommend having raised beds so you never compact the soil once you have dug it. It helps if you live nearby the allotment. My plot is 3 minutes drive away so I sit on my front doorstep pull on my wellies and away I go. • Take a fork and test the ground for workablility, it can vary a lot. • Invest in a hose, as your plot is near a water source saves time lugging watering cans about. 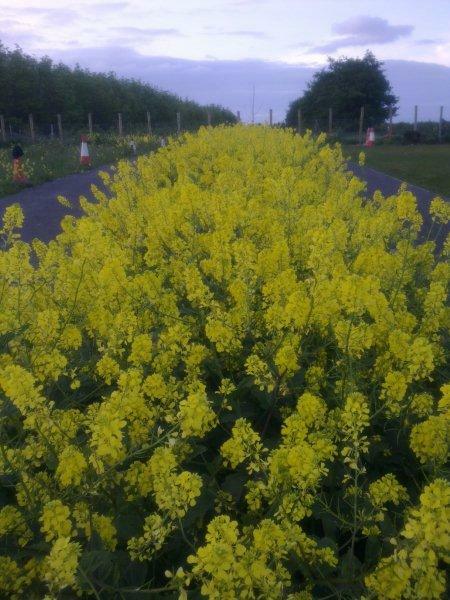 • Surrounded by developed plots helps to reduce problems with weeds. If there are some ones running wild, get on to the council. These could cause problems for a lot of allotment holders once the weeds go to seed. • Look out for perennial weeds unless of course you like hard work. • The time of year you take it over is important. These allotments were ready in early March, however the weather was still very cold and frosty so you need to start warming the soil with a covering. • Talk to the neighbouring plotholders to see what they are like, I forgot to! There are different approaches, but if you want to keep it up together rather than blitzing it I should reckon that once you start planting stuff towards the end of February four-five hours a week would do, although if you are very keen & enjoy it you might do more. 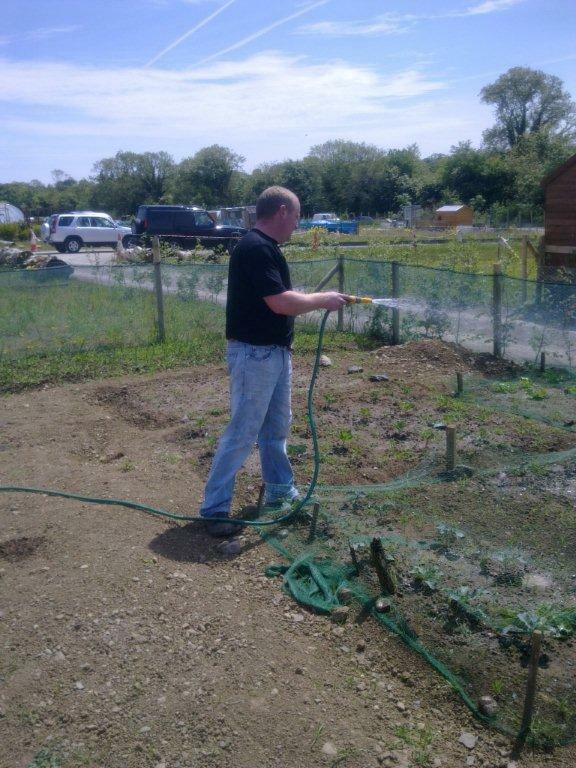 You would have to be focused & could not count the time chatting to other allotmenteers if that’s what you like doing. If successful in growing crops picking them can be time consuming, and personally I try to get over every night for an hour or so during the summer months when the evenings are light, although a minimum of every other day would be adequate. It’s so relaxing that it does not seem like a chore. Iit’s not really hard work although it can be tiring if you push yourself in short bursts, for example to make progress digging. Also it can make your joints stiff if you bend unnaturally while digging or weeding. There is no need to though you just need to think about it. I think it is mostly good organization and planning, together with a regular commitment. It’s the usual story, a little and often. It’s too easy to forget about something which you have to walk to or drive to. Apart from the plot, what else do you need? • Tools: With tools, to an extent you get what you pay for, you need something durable and not too heavy to lift. You need a Spade and Fork for digging (If you are tall, ie around 6 foot, consider so called extra long ones).I mostly use a fork but a spade comes in useful. You need a hoe, for weeding on dry days, a rake for preparing a bed for seeds or small seedlings, a small trowel for digging out perennial weeds where you can’t use a fork and for planting young seedlings. You can make a line from two short, thin pieces of wood and some twine. A dibber is useful and an appropriate shaped piece of wood can also easily be used for this purpose. • Materials: If you have somewhere to grow seedlings, like a conservatory, it gives them a start against the slugs etc. In which case you’ll need potting compost and cheap little reusable pots although you can pay more and get more sophisticated trays for seeds which split apart. It is worth saving the larger quart or litre plastic bottles as with the bottom cut off they make ideal protection against the elements and wildlife (slugs and birds especially) for young plants. • You will probably need a barrow unless you can borrow one. When trench digging you need to shift soil from the starting trench to where you will finish, and you may need to shift manure around, too. • Manure will improve the soil structure and may be used as a mulch to keep down the weeds. It also provides the plants with essential nutrients. The council left lots near the boundary of the site and is free to take. Alternatively it usually costs about 5 euro a bag. Most stables will let you collect it free if you have a trailer or van or some other way of getting it home. (Not recommended in the back of a hatchback unless very carefully bagged). The “correct” thing to do with the manure is to cover it with polythene until it rots down. It could be counterproductive and can actually spread weeds if it has not got hot and it’s not likely to do this if you spread it out before it has rotted properly. (It depends on what the horses have eaten). Also although many allotmenteers use it in autumn rather than in spring, like my dad did, it is better to save it in a heap because it will retain more of its nutrients which will otherwise leach away. Not much weed will grow during the winter and what does can be hoed off on a dry sunny day when you feel like it. It is a constant battle because there are so many seeds in the soil and borne on the wind and they survive for years. save it until the spring. Saving the manure until spring & covering it with polythene will help it get hot & rot down and will stop the goodness just leaching away, for winter is a long time. In spring dig it in unless you are happy to risk it having weeds in it (I wouldn't risk it) or if you particularly want to use it as a mulch to keep in moisture, in which case apply it after a period of wet weather. 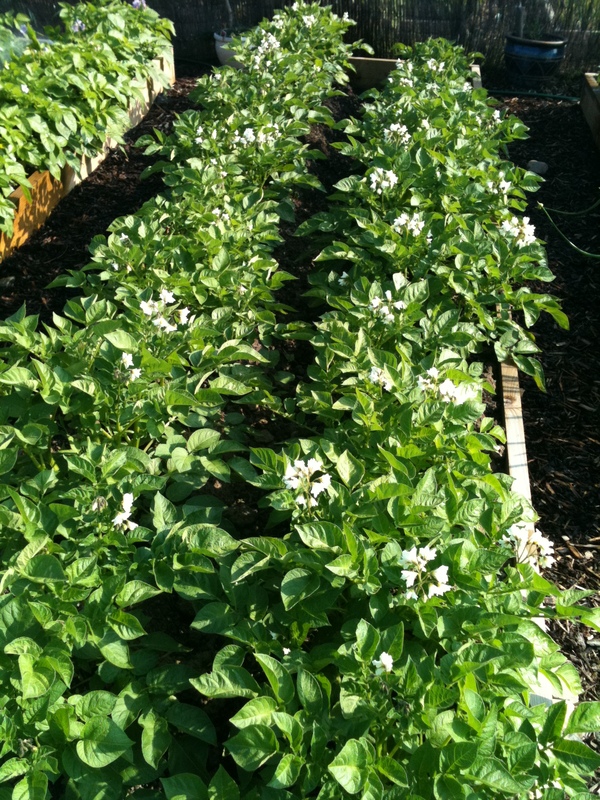 • Seeds: I probably spend about 40 euro or less on seeds each year, and then there are potatoes and odd bits on top. Fruit bushes can be quite costly but if you ask they might bulk order them to reduce the price. If you don’t mind waiting you can take cuttings. Strawberries are much cheaper at a garden centre and again you can propagate them fairly easily to save money. Another 50 euro would probably get you a good selection of fruit bushes to start with, although if you bought from a mail order catalogue I think you would pay more. You don’t have to do it all at once, anyway. While digging, look out for cutworm, leatherjacket sand cockchafer grubs, these pests like living in grass and can be a particular problem in areas which have become grassed over. If you find them destroy them or they will have a go at your crops when the plants begin to grow. Also rejoice if you find these centipedes because they are a friend to the gardener. It is mainly carnivorous, feeding on live animals such as insects, earthworms, spiders, and slugs. The first pair of legs is modified into poisonous jaws located below the mouth to kill their prey. Centipedes’ antennae are longer than those of millipedes and have they one set of legs to each segment whereas the millipede has two. Millipedes are harmful, they nibble plant roots and will attack soft fruit such as strawberries which are accessible to them. The millipede is darker in colour: brown/black. It moves fast, so if you can catch it kill it, otherwise it will attack your plants. Contrary to its name the centipede does not have a hundred legs, try counting them. It’s not advisable to touch them. While they probably won’t break the skin, if they do they will give you a nasty nip. If you are starting out in winter I would dig the plot when its fine and plan when its not. Digging puts you in touch with the plot, the contact is essential and the fresh air helps to recharge the batteries. Planning is important so you are at least one step ahead and, of course, both digging and planning are very enjoyable. Prepare the ground by digging it over to remove the weeds and plan to begin planting in spring. Dig out a trench to one spade depth (or to the depth of the topsoil if less than this) and barrow the soil to the other end of the plot. If you want to ‘double dig’ you loosen soil to another spade's depth using a fork pushed into the soil then moving it backwards and forwards. If the soil is not too compacted I wouldn’t bother to double dig it. Continue filling up the previous trench with soil from the next one. moving backwards as you go so you don’t tread on what you have dug. This is a basic principle when hoeing, too, so you don’t tread the weeds back in. Finally, fill the final trench with the first soil removed. Avoid mixing subsoil and topsoil, there is a change in colour where topsoil becomes subsoil. Walking on the soil compacts it. The easiest way to avoid this is to create raised beds about 3 or 4 feet wide, so that all work can be carried out from walkways in between. Create these simply by throwing soil from the walkway onto the bed, as you go. Once you commit yourself to raised beds you never have to really dig again, except to maintain the walkways, for the effort required to turn the soil is minimal when it is not compacted. I would plan what I intend to plant in each of the beds and make sure I have a crop rotation in mind. Couch grass looks like grass but underneath the roots are brown or white and they extend along & underneath the surface. It's no good digging it in because it will just sprout & the more you split it the more it grows. You have to aim to get every last bit out & then when it sprouts up from the bits you miss you dig that out too. And so on until you get the lot. Obviously, using a rotavator on perennial weeds is going to make them worse, which is why I am doubtful that rotavating these weeds can save work in the long run. Couch Grass and Bindweed are not too hard to remove unless they go very deep. As they become more established they are more and more difficult to shift. It is fine to dig annuals in, especially if you dig a trench in front of you one spit(spade) deep and turn the top stuff into it. Alternatively you can safely put these weeds on the compost heap, preferably when they have not been let run to seed. Try to sort out any perennials like couch grass, dandelion, horsetail, and bindweed etc. Create a compost bin which is divided in two so that while the current compost is being added the previous compost is rotting down. It should be easy to turn the compost in the bin. Keith has one of the new plastic ones which are provided at a subsidised price by the council. It is perfect for the job and seems to be very flexible in the size and shape you make it. It's also easy to turn the contents, which was a problem with the old style ones. Although more expensive I reckon the new design is a snip at the price. I have a couple of old style ones for rotting down manure. A double compartment open wooden structure is fine.I constructed mine from pallet wood. Add all your kitchen waste without cooked stuff ( it might attract rats) or citrus fruits( too acidic – you may add some but not too much) and all the waste stuff from your plot. (except pernicious stuff like horsetail, bindweed - perennials & crops with whiterot or clubroot or other nasty diseases). It is important to add fibrous material like shredded newspaper or it ends up as a gungy mess. Turn it in autumn and spring ie shove it all in the other side. Spread it on your beds when it looks like soil. (I’m always amazed how much it reduces in size as it rots down). Keep both sides & especially the older one covered with black polythene. The Waste Resources Action Programme website has an excellent Home Composting section which explains the way to do it as clearly as I have seen, and it is well worth a viewing.